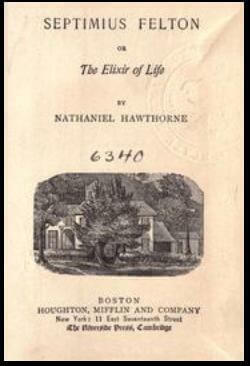 Septimius Felton; or, The Elixir of Life was Hawthorne's last story, an unfinished manuscript which was found by his wife posthumously, and after she passed away, transcribed by her daughters with few revisions, published in 1871. We offer the 1883 edition with the preface in which Hawthorne's daughter Una wrote that she hoped it "will have an added interest for brother artists, and for those who care to study the method of his composition" [without Hawthorne's final revisions]. The work may have inspired H.P. Lovecraft's novella, The Dreams in the Witch House.